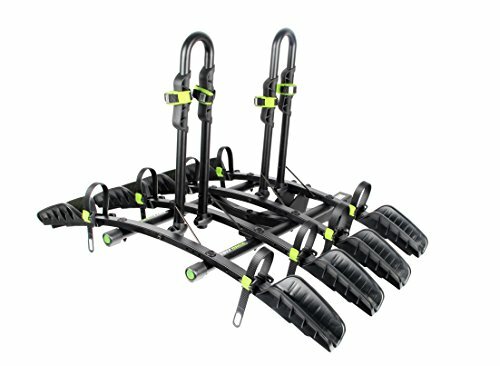 Compatible with 2" receiver hitches and capable of carrying four bikes, the BUZZRACK Express takes bike transport to a whole new level. A lower level that is, which makes loading bikes easier than ever! The low platform means no overhead lifting and no wheel removal is required to load up to four bikes of almost any frame design or wheel size. Quickly adjust the wheel trays to accommodate women's, kids', road, mountain, full suspension and 29er bikes. Secure the bikes with the no-fuss ratchet straps and upright frame cradles and you're ready to go. After your ride, the platform folds up flat to make parking and storage easier. With features that make bike loading a breeze, you'll be on the road in no time with the BUZZRACK Express! _______________________________________________________________________________________________________________________________________________________________NOTE: This rack does not fit fat tire bikes and is not recommended for use on models of the Ford Flex which have centrally positioned exhaust pipes, due to the risk of burning/melting the bicycle tires and/or wheel supports. _______________________________________________________________________________________________________________________________________________________________Accessories: Hitch lock set (B0733BW19R), Replacement Wheel Straps-Length: 492mm /19-3/8" (B0733BXHWN) or Length: 392mm /15-7/16" (B073392ZSM). _______________________________________________________________________________________________________________________________________________________________-If you have any questions or encounter any issues with your BUZZRACK Rack product, or if you need replacement parts or any other after sales service, don't hesitate to contact us on Amazon using the "Contact Seller" feature, or by using the "Contact Us" tab on our own website. If you have any questions about this product by BUZZRACK, contact us by completing and submitting the form below. If you are looking for a specif part number, please include it with your message.